All athletes should wear eye protection. Unfortunately, sports eye injuries are quite common, but with proper sports vision safety equipment most injuries can be easily prevented. More than 40,000 sports-related eye injuries are reported annually in the United States, many of them causing permanent damage to a player's vision. Types of injuries can range from simple bruises and irritation to fractured eye sockets, retinal detachment, and blindness. Outdoor athletes may also be subject to excessive ultraviolet radiation that can lead to tumors, cataracts, keratitis, and other conditions. Fortunately, with the proper equipment, more than 90 percent of eye-related injuries can be prevented. Sports glasses: These specially made eyeglasses or sunglasses are designed with a player's needs in mind. Sports goggles: More form fitting and generally thicker, goggles are often used for swimming, motocross racing, and other sports where high speeds are present and debris may be pushed into the eye. Face shields: These full-face shields are the most comprehensive yet most unwieldy type of vision safety equipment, though certain sports venues - particularly Little League baseball and competitive paintball - may require them. The type of visual protection a player chooses often depends on their visual needs as well as what type of eye protection best suits their preferred sport. When choosing which models to buy for the best visual protection, athletes should consider whether the equipment can protect against the trauma, potential debris, and excessive sunlight particular to an individual sport. If an athlete plays several sports, several different pairs of safety glasses may be necessary. Trying on a variety of styles and sizes can help individuals find one that fits best without impairing performance, including visual acuity and peripheral vision. At the same time, the glasses should be comfortable, and many stylish models are available. Prices range from less than $20 for a simple pair of safety sunglasses to more than $150 for a specialty pair of prescription glasses. Buyers may be able to comparison shop for discount prices, and some retailers will offer deals to teams or registered athletes. 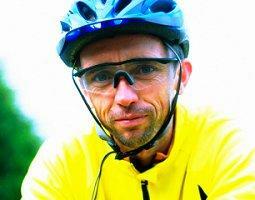 Wearing the proper sports vision safety equipment is not enough to safeguard against accidents and injuries. Players should always behave responsibly and avoid horseplay or dangerous situations, and safety gear should be cared for properly so it can continue to be effective for many games and competitions to come. The proper safety gear is essential for safe sports participation, and safety goggles, glasses, and face shields should be a part of every athlete's equipment. Worn properly, glasses can prevent most eye-related injuries, allowing the athlete to clearly see his or her victory.